Tom Cruise is back as the super spy, Ethan Hunt, in the fourth installment of the Mission Impossible series - Mission: Impossible - Ghost Protocol; and the latest poster of the movie was released online by Paramount Pictures. The poster is a dark one and sends a clear message - Ethan Hunt is in no mood for fun, and no matter where you hide, he will hunt you down! 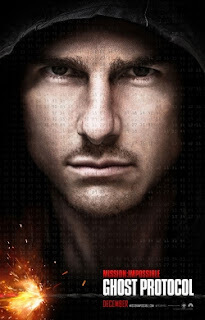 In the poster, Tom Cruise gives a sturdy look and one can spot him in the same hood he is donning in the trailer! Mission: Impossible - Ghost Protocol sees the return of the best looking spy in the world, Tom Cruise as Ethan Hunt, who with his team will go undercover to clear their organization’s name, Impossible Missions Force (IMF), since IMF has been shut down after it’s drawn in a global terrorist bombing plot. Well, the poster and the trailer, both look impressive! And, in case the Indian fans are disappointed after not seeing Anil Kapoor in the trailer and the poster, we just hope we can somehow spot him in the movie! Wink.